Hi Phil! Takes for this nice hack. I did this with our self-storage locations – temporarily changed our primary category to “restaurant” added a reservation URL and then changed the primary category back – and it looks great on desktop but on mobile instead of saying “Reservations” and listing our URL it says “Find a table” which obviously doesn’t fit the type of reservations we’re offering. Just something to be aware of for any other people trying this hack! That’s crazy, Matt. Thanks for the intel! HI, I just tried this in the UK – changed it to Dentist, this allowed an “Appointment” URL, added and it looked good – went back to change it to the original primary category and it disappeared? Not sure where to go from here? 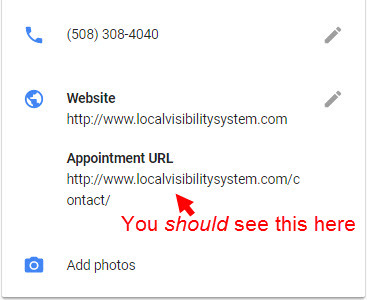 Yeah, the “appointment” URL will disappear from the GMB dashboard, though searchers will see it publicly (in your knowledge panel). So there’s no way to change the label other than changing the category? This is daft! I have a client who is a winery with a restaurant on premises, and their label says “Appointments” – we don’t want to change it to restaurant because they aren’t just a restaurant – why can we not simply edit the label?? Gah!! Google does my head in sometimes!